I’m off to Barcelona to finish up my new book and I wanted to tell everyone how I’m going to stay for a month on a budget. It has been on my goal list for quite a while and so I’m super excited to get it off my list. My vision was to go to a Mediterranean seaside city, enjoy the beach everyday, get place with a terrace where I can look over the city and write away! I’m so happy I get to do it now! 1. Rent an Apartment: Instead of getting a hotel I’ve been looking on craigslist.org and asking friends for a place to stay in for a month. I’ll be able to get a great place for a cheaper rate by renting someone else’s home for a month. Plus I’ll get to make my own food and do my own laundry while I’m away. 2. Use Points to Fly: I recently bought a ton of furniture for my new place and I knew I was going away so I got a no fee for the first year BMO MasterCard World Elite card. I was able to use the points I’ve accumulated to get a free ticket – woo hoo! 3. Go During Low Season: Instead of going in the busy summer time I booked August 24th to the end of September. It won’t be as hot, touristy and there is labour day holiday in there to cut down on missed business days. Win win win. 4. 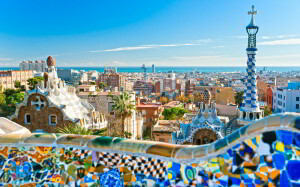 Stay in One Place: I’m going to hunker down and enjoy Barcelona. I’m going to take some Spanish classes in the morning. Shop for wine and fresh groceries in the afternoon and then enjoy the nightlife and write in the evening. Probably lots more nightlife than I’m expecting. I’ll really get to enjoy the city and I’ll cut down on the costs of traveling from city to city. 5. Make Money When Away: I’m looking for friends to rent out my place for a month so I off set my own costs of renting. airbnb.ca is a great place to put your place up for rent! I’ll also be working on articles and writing that will make me money when I get back. Set your ultimate goals and then make them all come true by being smart with your money. What goal can you make a plan for a bang off your own goals list? Make five steps to achieving it right now. It’ll feel awesome.